I'm scared on a few levels in fact. Firstly, this isn't really a review I'm allowed to do, so let's get it out the way quickly. My wife is a vegetarian, and I love her for the conviction she has in trying to avoid all meat. I remember her anguish on finding she'd eaten a slice of bread 'fortified' with 0.05% fish oil. I didn't hear the end of that one for weeks, and as such, decided it best not to mention a few years later, on a trip to Australia, that I thought the chips we were eating were flavoured with chicken salt. This deep hatred of the ingestion of slabs of dead animal has spread to our kids. Luke has on several occasions come close to nicking s delicious chicken nugget off a friend, only to be reminded he doesn't like chicken. Never mind the fact a chicken has seldom been near any chicken nugget. 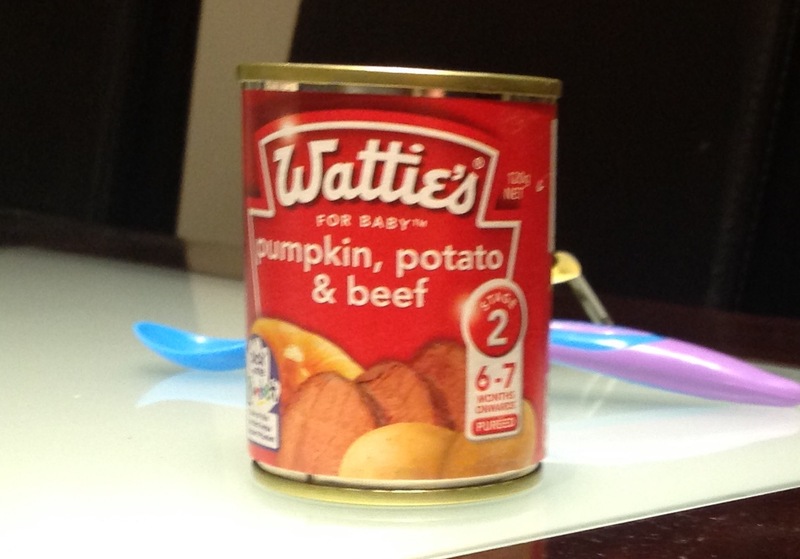 So, in short, we're not meant to have meat-laced baby food within the house. But this was on special, I was at the supermarket, I needed something to draw readers back in to my blog... So here we are. and that brings me to the second reason I'm scared.... Now I have to eat the bloody stuff. Still, babies eat it, apparently, so how hard can it be? Here we go again... Lots of pumpkin, not much of anything else. In fact, I'm going out on a limb here and I'll say that this is going to taste more of pumpkin than anything else. hey Watties, why not just make it entirely pumpkin, aye? Of note, however, is the mystery 'herb' listed in the ingredients. Singular, note. Is it basil? Thyme? Rosemary? Sage? Do babies even like herbs? I don't know. I'll tell you who does like herbs, though, and that's Sean Connery, though only partially. First impressions: looking at the label of this, I'm expecting a nice roast dinner. Like one of Willie Wonka's three course gums, but instead of a gum, it's a puréed mush. Beautifully sliced roast beef, and a whole crown pumpkin appear enticingly on the tin. Opening the can, the appearance of said mush isn't as inspiring a sight as the package art work. 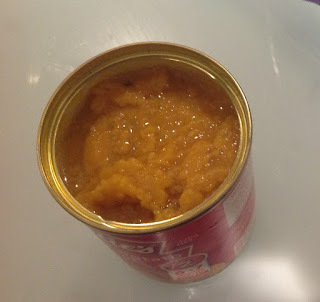 Very watery looking, bright orange ochre, not the most appetising thing I've seen today. Surprisingly, savoury beef lingers long on the nose, along with water. Very little pumpkin or potato, though I don't really know that potato really does smell like anything, truth be told. Taste test: guess what? Tastes of pumpkin! There are a few nuggety soft chunks which put me in the mind of small flecks of budget mince in a university flat bolognese, but the beef flavour doesn't really shine through that well. Maybe they don't want to save the finest cuts of sirloin for the under 8 monthers, but Watties could still try and give the meat content a bit more believability. Strangely, the water and potatoes make more of an impression, though the carrot is about as anonymous as it is on the label, however. Guess what, though! Right at the back of the palate, there is indeed the slightest hint of parsley! And you know what, just for once it is nice to eat a baby food not trying to indulge itself in superfood wankery by trying to include a miniscule portion of quinoa, so ka pai for that, Watties. Enjoy: you could try with a nice central Otago Pinot noir, but that would be a waste of good wine. My advice would be ditch the food, just buy some proper steak.